NEW YORK (CNS) — Viewers of almost any age will find themselves well rewarded for tracking down “Muppets Most Wanted” (Disney). Some brushes with peril integral to its farfetched story might frighten the very smallest audience members. But this sprightly musical outing for the beloved puppet ensemble created by Jim Henson makes winning, family-friendly entertainment for all others. 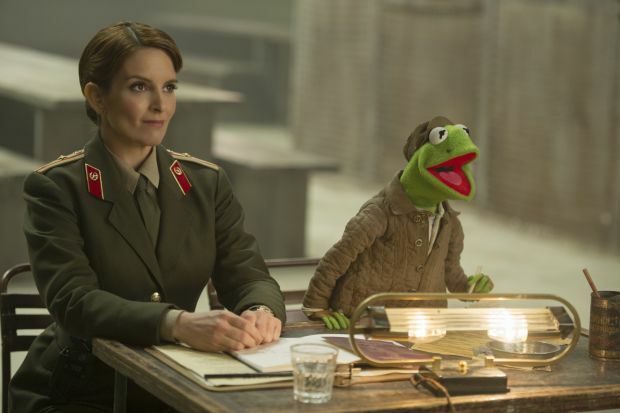 As part of his plans for a daring jewel heist, Constantine, freshly escaped from the gulag himself, is out to take Kermit’s place on a forthcoming Muppet world tour. Aiding Constantine’s scheme is his smooth talking human confederate Dominic Badguy (Ricky Gervais). Dominic — who explains away his telltale last name by asserting that it’s French and therefore pronounced “Bad-gee” — has managed to insinuate himself into the role of the Muppet’s manager. While Kermit languishes in the arctic under the supervision of his over-the-top principal jailer Nadya (a hilarious Tina Fey), all his old chums except Animal (voice of Eric Jacobson) are taken in by the impostor. Part of Constantine’s success rests on his promise to give the Muppets whatever they want, beginning with Miss Piggy (also voiced by Jacobson) whom the faux Kermit finally — and all-too-readily — agrees to marry. Director and co-writer (with Nicholas Stoller) James Bobin’s follow-up to his 2011 re-launch “The Muppets” combines singing, dancing, innocent humor and entertaining cameos. The resulting treat is then topped off with an endearing message about loyalty to friends. Bobin and Stoller’s script also cautions against greed and egotism, sending positive signals for youngsters amid the lively fun. “Muppets Most Wanted” is preceded by a “Monsters University”-inspired short called “Party Central.” While this is also generally diverting, at least some parents may find a character’s fleeting reference to “making out” an incongruous bit of dialogue in an animated movie obviously aimed at small fry. The film contains some slapstick violence. The Catholic News Service classification is A-I — general patronage. The Motion Picture Association of America rating is PG — parental guidance suggested. Some material may not be suitable for children.